The meaning of retreat is to withdrawal from the familiar to a quiet, isolated place. For the weekend, we will allow ourselves the freedom from daily life and embark on a journey into the wonders of yoga. The emphasis of the retreat will be on balance between body and mind. Through physical practice we will relax the body, and with the help of meditation techniques, we will learn about the principles that guide to healthy lifestyle and self-knowledge. Yoga is manifested in various areas of our lives and teaches us in every action and thought, to be aware and concentrate on what is happening. To act for the action and not for its fruits, to be receptive to everything that comes to our lives and devotion to what is not in our control, but to the power of something greater than ourselves. Beyond that yoga allows us to see what is happening in our lives from a different perspective from the insatiable ego to the observer, the observer, who gives us the tools to see and accept things as they are and respond accordingly from a more conscious and rational place. From the physical, energetic, emotional, intelligent body and beyond to the body that is in eternal bliss, one with the Higher Self, we will illuminate the personal and social universal moral rules that distinguish us as human beings. We will walk meditatively in the light of the moon and the stars in the silence of the desert. We will learn about the principles of Indian medicine - Ayurveda, and for dessert we will also experience a pampering Thai massage lesson. The workshop is suitable for anyone, veteran practitioners who wish to deepen their yogic practice. And new practitioners who want to know yoga deeply. No early experience required. Prices include the cost of the workshop, hospitality, six vegetarian meals and a coffee, tea and fruit area open throughout the duration of the workshop. * Starting from the first of the month the price increases by 100 NIS. Yoga retreats, Buddhist meditation and Thai Massage workshop leader in the desert ashram. also teaches classes and workshops in India and Thailand. Practicing and learning about the wisdom of yoga and meditation for over 15 years. Certified teacher for 7 years: Shivananda Yoga, Rishikesh. Ashtanga Vinyasa, Israel. Yoga Vedanta, India. Thai Massage, Chiang Mai. Assistant in Ashtanga Vinyasa Yoga Teacher Course, moderated by Shimon Ben Avi. Over the years, he practiced and meditate in many Buddhist monasteries throughout the East. He has been conducting workshops in the desert ashram for five years, during which he has taken an active part over the years. 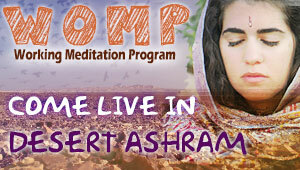 During the summer he has taken over the post of WOMP supervisor - a work and meditation program that takes place in the ashram. Practice yoga and meditation for over a decade. Trained as Shivananda yoga teacher in rishikesh, India and as ashtanga viniyasa asistent and yoga teacher in Israel.